"Life In Adairsville, The Book and the Town"
"Book Collecting For Fun and Income"
"Bartow County History and Landmarks in the Davis Morgan Mysteries"
"Fiction as a Christian Tool"
Wanda is available, at no cost, to lead "Davis Morgan tours" for groups of three or more. Danny & Wanda are available as a team for book signings, book clubs, and other events. ​​ JANUARY 6- Danny will speak at the morning service of the First Christian Church in Dalton, GA.
FEBRUARY 19- Danny will speak about his books for one of the Cartersville Rotary Clubs at Johnny Mitchell's Steak House ​ at 7:30 a.m.
FEBRUARY 28- Launch of the most recent Davis Morgan Mystery, LIKE A TREE, will be at the Depot in Adairsville from 6:00 p.m. till 9:00 p.m.
MARCH 26- Date of the official publisher's release of LIKE A TREE, A Davis Morgan Mystery. MARCH 30 - Danny & Wanda will sign LIKE A TREE at Dogwood Bks on Broad Street in Rome, GA. 1:00 till 3:00 pm. Shelbyville, Indiana 1 till 3 pm. SEPTEMBER 7 & 8- Danny & Wanda will sign their books at the Pine Log Arts & Crafts Festival. 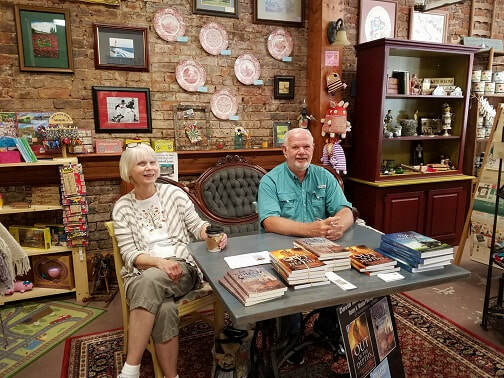 OCTOBER 1 & 2- Danny and Wanda will sign their books at the Christmas Village in Cartersville, GA.
Other events will be added as the year progresses.